Runs in 3 Parts from 1/25/2018 to 2/8/2018. 3 Chances to Unlock New Unit. Don't forget to grab your 10 FREE UNITS! Hopefully this unit doesn't bomb! I might try and unlock this unit. Thanks for the heads up, DS. Yes, yes, yes... Events are back for another useless unit !!! Time to lose sanity again and many hours of sleep to get the Bonus Crates as fast as possible and try to do as many objectives as I can to upgrade all my elites for my 4 SWC accounts !!! Bye bye friends and family, see you guys someday... Who needs social life when we have another awesome unit to unlock? Ops, and Ithorians now are available for conflicts on Takodana??? mkenobi wrote: Yes, yes, yes... Events are back for another useless unit !!! Time to lose sanity again and many hours of sleep to get the Bonus Crates as fast as possible and try to do as many objectives as I can to upgrade all my elites for my 4 SWC accounts !!! 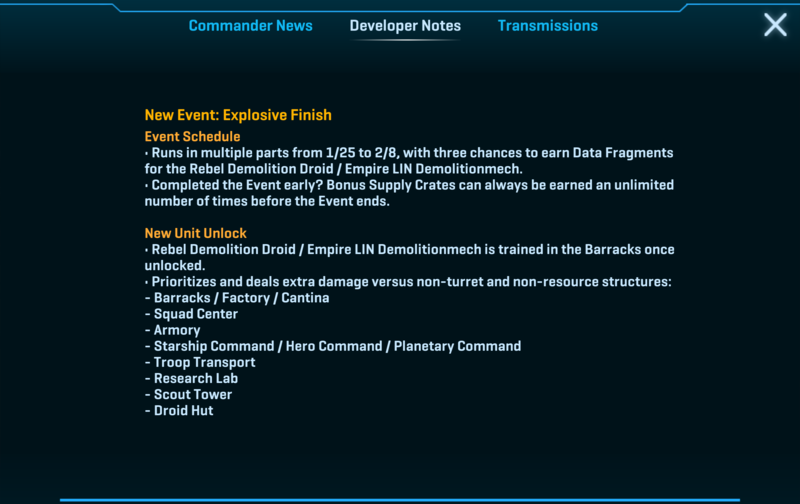 mkenobi wrote: Yes, yes, yes... Events are back for another useless unit !!! Time to lose sanity again and many hours of sleep to get the Bonus Crates as fast as possible and try to do as many objectives as I can to upgrade all my elites for my 4 SWC accounts !!! Bye bye friends and family, see you guys someday... Who needs social life when we have another awesome unit to unlock? 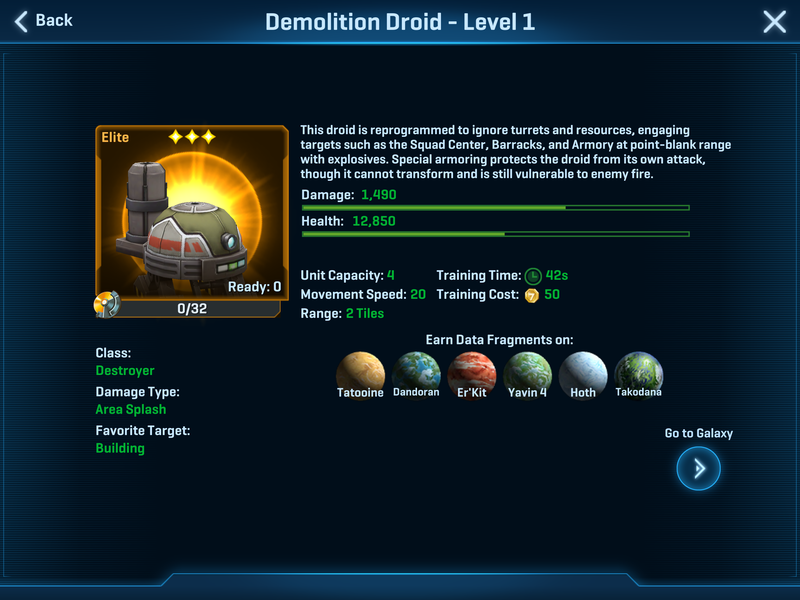 I just tried out my level 9 sample droid and it took about a minute to slowly destroy one unit transport. One single stormtrooper would have been quicker I think. I swear these developers don't actually test anything they create! This issue, first noted in the inaugural SWC Event, remains... any EP earned via Tier 2 - Squad Daily Objective - will cause an error... and if you re-boot it is LOST! Spock - I too provided the same link... Thanks for Posting! Event Crates earned via EP for all Event Objectives except Chapter Objectives are rewarding Elite Event Unit Data Fragments and/or Armory Elite Unit Skin Data Frags (2 separate Awards) + Resources.